Two recipes in January was twice as nice, so we’re doing it again for February. This time, the focus is on a more traditional fall/winter ingredient: the apple. Why? Because they’re everywhere. America is the #2 producer of apples in the world. All 50 states grow them, and 36 states sell them commercially. Six states have the apple as their state fruit (with Illinois naming a specific variety). That’s 12%! So let’s have some fun with this ingredient. I’ve chosen a hot drink since it’s toddy season. Personally, when it’s cold outside, I can think of few things more enjoyable than a warm boozy drink in front of a fire. Yet if you’re not in the mood for a warm cocktail, then the idea of them can be unappealing. Hence, a cold apple drink as well. These drinks have a similar composition, with bourbon as the base. The hot toddy gives you a little more alcohol if that’s what you’re going for. And it’s a bit sweeter, with traditional dessert ingredients as the garnish. The cold drink provides a little more of a tart flavor, with fresh lemon to provide a little kick. Whatever your preference, pick the one you like (or maybe try both), turn on your kitchen appliance of choice, and let’s go! And don’t let the “kitchen appliance” part scare you. These drinks are EASY. Heat the syrup and cider together on the stove or in the microwave until steam rises. Pour the bourbon into a mug, then add the cider mixture, stirring everything together. Garnish with whipped cream and nutmeg. Look out the window at the snow on the ground while you sip. Prefer something cold instead? Coming right up! Combine all ingredient except the apple into a blender. Blend until you achieve your desired consistency. Pour the mixture into a cocktail glass. Garnish with either an apple wedge on the side of the glass, or a thin slice floating on the top. 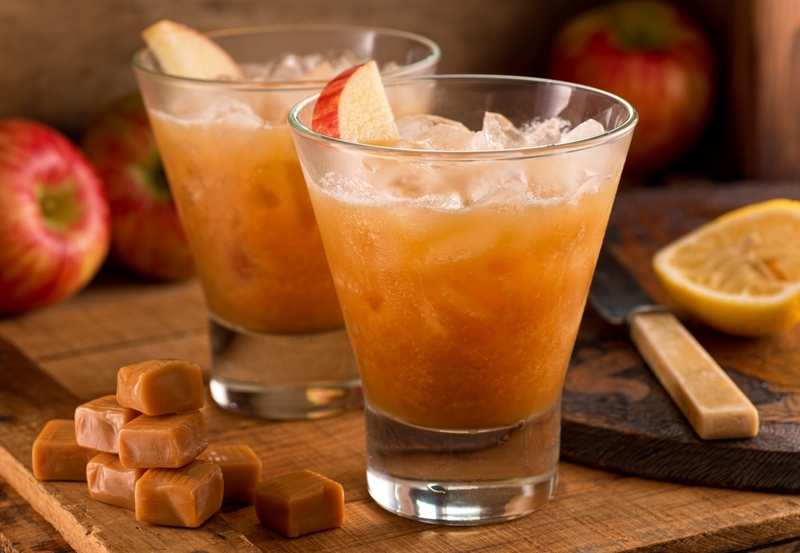 PS – These recipes are inspired by my cousin Karen, who sent me a photo of a beautiful apple drink she tried while she was skiing (although probably not at the very same moment). I take requests for both the drink of the month and the recipes page. If there’s something you’d like a recipe for, let me know at @cocktailspy (Twitter and Instagram), post them on the CocktailSpy.com Facebook page, or email them to thecocktailspy[at]gmail.com.